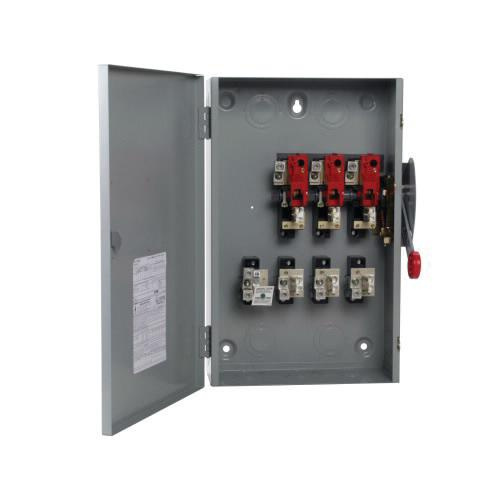 Eaton K Series 3-Pole 4-Wire General-duty safety switch is rated at 200-Amps and 240-Volt AC. It has power rating of 15 hp at 240-Volt AC for 1-Phase and 25 - 30 hp at 240-Volt AC for 3-Phase. Switch features painted steel construction. It has visible double-break, quick-make and quick-break rotary blade mechanism for faster switching operation. Fusible switch with solid neutral, provides ample wire bending space provides for easier installation. It measures 10-Inch x 15.52-Inch x 25.23-Inch. This 3PST switch uses Class H cartridge fuse for providing protection to low-voltage electrical installation against short-circuit/overload current. It has mechanically interlocked cover that prevents internal device access during On position. It is perfect for residential and commercial applications. It has NEMA 1 rated indoor enclosure for safety. Switch is UL listed.